Dome Knobs, Metal with Pearl Top, Color Choice. Set of 4. Dome Knobs, Metal with Pearl Top, Set Screw Style, Color Choice. Set of 4. Speed Knobs: Set of 4. Your choice of colors. Fits Gibson LPs SGs. 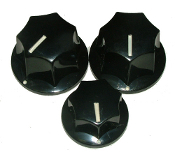 Tophat Knobs: Set of 4 fine knurled knobs with Abalone Tops and set screw. Your choice of colors. Fits split shaft pots.